Mod post: Moving or mirroring the community on Dreamwidth? No decisions have been made at this time. This is an open comment post about the possibility of moving the community (and closing our LJ doors) or mirroring the community (and leaving posting access at both LJ and DW). Where do you prefer to post and read, these days? Would you continue to use the community if it moved over completely? ETA: Why would we do this? As of a few days ago, the LJ servers are located in Russia, which means everything posted to LJ is no longer covered by US laws (including data protection and freedom of speech). Many people are uncomfortable with the change and are leaving LJ completely. What is Dreamwidth? DW started eight years ago as a fork of LJ's open-source code (basically a duplicate, so the posting/community/friending structure is very similar to LJ). Since then they have made many changes and improvements. DW is free and sells no advertising - all of their revenue comes from paid accounts of various types. DW can import a whole LJ (including comments), for those who want to back up their LJs. You can also set up an auto-crosspost from DW to LJ, if you have both and want your entries to show up in both places. Do I need a waist stay? My big project for 2017: a Victorian ballgown using Truly Victorian's 1860's bodice and ball gown skirt. This requires the proper undergarments. 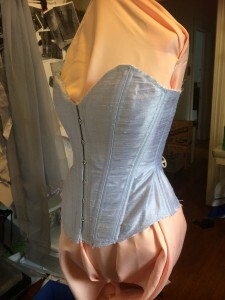 I'll be using Laughing Moon's Dore corset pattern and it's not my first time making a pair of stays/bodies/corset. And in fact, no foundation garments I've ever made calls for a waist stay, but this pattern does. Is it because of the boning casing? I plan on doing the sandwich method and I'll be flatlining the entire thing, so I'm not sure if I still need a waist stay or not. I thought it would be polite of me to introduce myself before I make any other posts. My name is Yvonne, I'm dutch, 31 years old, EU size 46 at the moment, did fashion school 10 years ago so I'm not new to sewing or patterning. 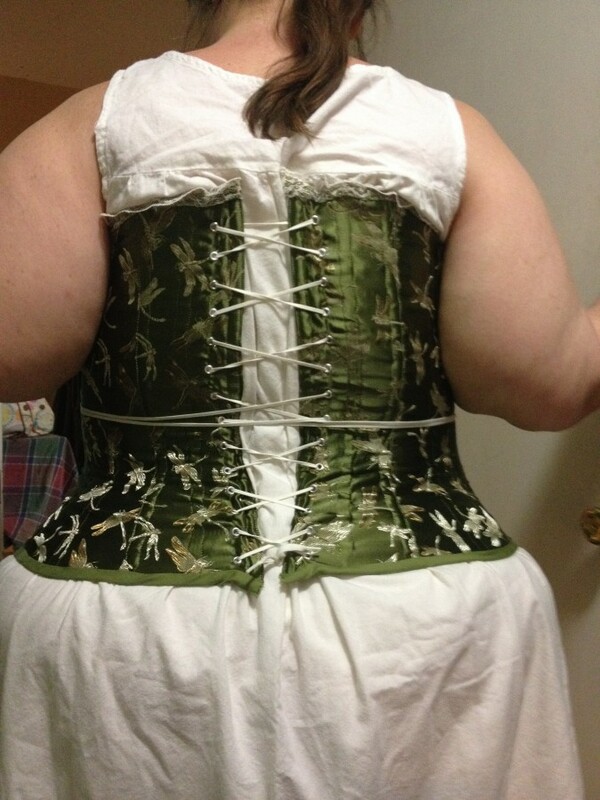 I'm also not new to corset wearing. I had 2 fully custom underwear underbust corsets made by a lady in the Netherlands, that was 7 ish years ago. I have worn them for special events the first 2 years after I got them, but then due to personal issues stopped wearing corsets (and nice looking clothes for that matter) and only recently started wearing nice clothes again. 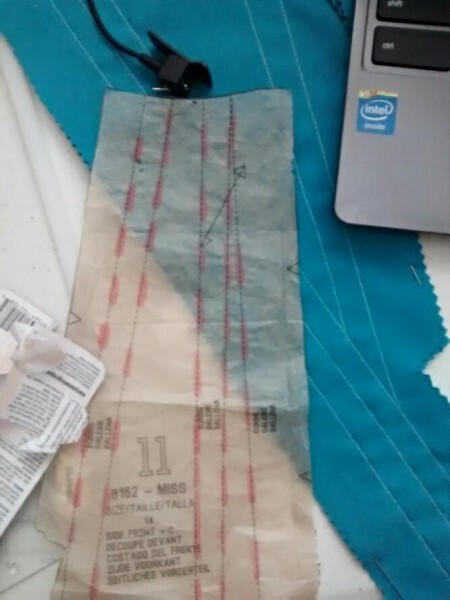 I'm making Simplicity 8162, the 1740's stays. I've cut out my strength layers and sewed boning channels. My question is, how do I insert boning in the channel that's a triangle shape? Do I just leave the boning as is, and insert it as far as I can, or do I shape the boning to the channel? I've never come across this before, hence the question. Thankfully there's only two channels like this. The others are either straight or slightly angled. Hey all, it's been a while since I posted here. ...a long while. I'm making my first corsets in a while and I'm getting the hip wrinkle we all know so well. I have seen various bits of advice (some very vague) about how to fix this. I've been told securing the boning (tight channels with tops and bottoms) or cutting the side panel off grain, and some people just say to make the curve less dramatic, but that's kind of what I'm going for here. In fact, in the last fitting the wrinkles weren't there because I hadn't taken in that last bit at the side. So what is everyone's favorite method of getting smooth side panels? I added some extra boning to one side to see if it would help, and it did. Now the wrinkles look more like something that could be fixed with roll pinning. We'll see if I feel up to picking all those seams apart or if I'll just plan for the future. 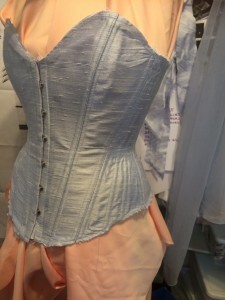 Just letting those of you who come here know that the Oxford Conference of Corsetry programme is on the website, and is being fleshed out as we get full info back from our presenters. Back for a second year, Barbara Pesendorfer of Royal Black will be talking us through the process of creating one of her amazing couture corsets. 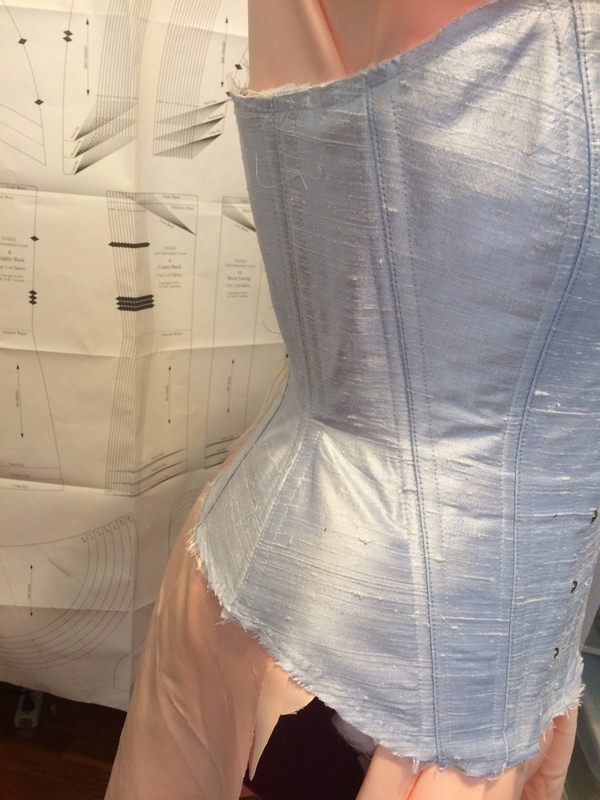 From inspiration, through pattern, toile, and final design and embellisment choices to the final garment! Very exciting. We've also got Laurie Tavan teaching. Marianne Faulkner of Pop Antique teaching fashion illustration, and Caroline Woollin on CAD for corsetry. On the second day we have Colin Gilchrist of The Social Tailor, who has incredible fashion industry experiences, talking about marketing for small business, and Catherine Claverng of Kiss Me Deadly helping you with branding. There is more yet to be confirmed. There is the opportunity to get your corset photographed by our team of amazing photographers on models including Threnody In Velvet (Morgana), Miss Deadly Red and Miss Tosh. On top of that we have lots of networking, socialising and sharing with a drinks reception, dinner and post dinner socialising. This year we're in the amazing, ancient Merton College (where Tolkein completed Lord Of The Ring during his time as professor there). But, the biggest stars are the other delegates. Amazing people at all stages of corset making from beginner to expert, all sharing their wonderful work and their passion. Come along and join us, we'd love to see you there. 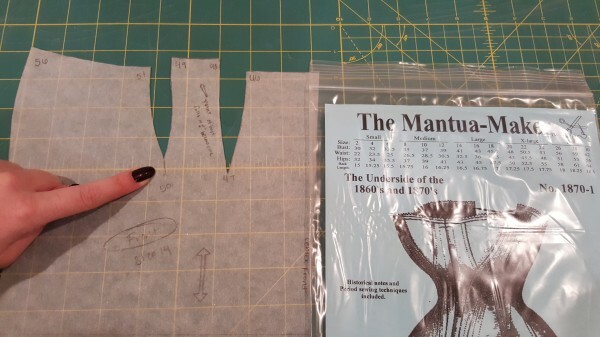 Mantua Maker 1870-1 help please! I looked through the archives for this pattern but didn't see anything pertaining to my question. I typically draft but wanted to try out gussets and thought this pattern was beautiful so here I am! About a year ago, I posted asking for suggestions on a mockup. 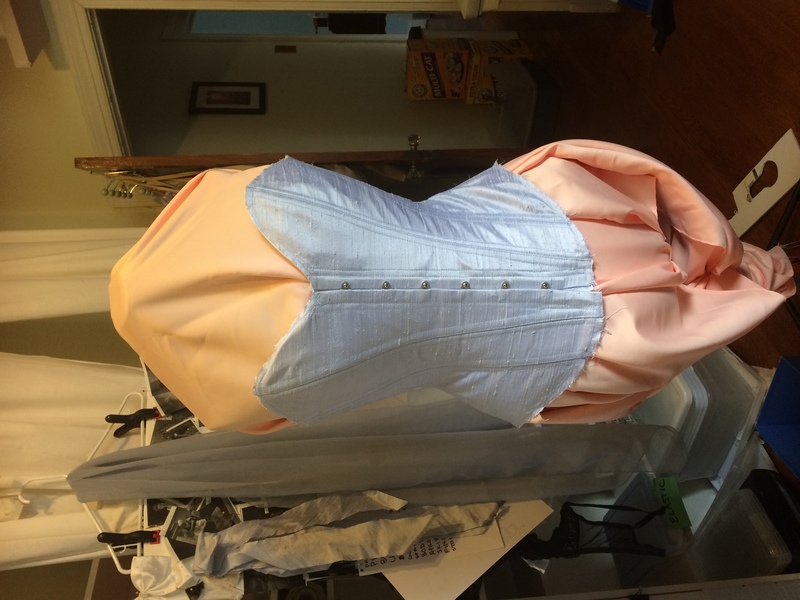 Thanks in large part to your all's help, I have finally finished my first corset. Please pardon the uneven lacing. My husband isn't yet fully qualified as a lady's maid. Pattern: TV 110, custom drafted to my measurements. 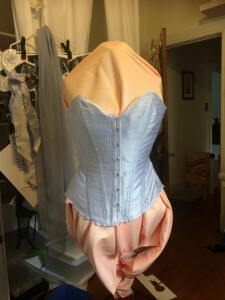 I am totally new to this and to corset making. I have done a costume that had a corset type look but it was not like the real ones. 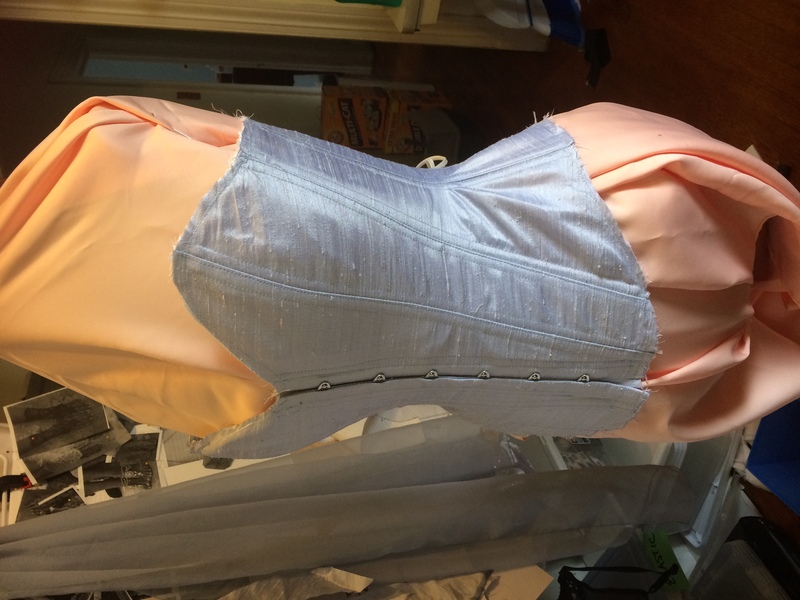 So I have been reading up on corset making and have learned a lot but as of yet have not made one but I do have a couple of patterns that I would like to try. I have a lot of questions and hopefully you can help. When using a busk do you just put holes in the material to get the hooks out? Do you really need to make a mock up? and what is coutil? Also when doing grommets I saw a bone with holes in it, do you still use the grommets in it? Thanks in advance for your help.